You know how old magazines patterns are ... it starts on page 27, another bit on 32, then back to 87 and on to 114. Well, this is one of those patterns. It took a fair amount of time to reformat and put together, but I think it has enough fun potential to make it well worth the effort. It starts with a simple crochet jacket, with below elbow sleeves, in an easy pattern stitch alternating between single and double crochets. All by itself, it is a great cover-up, worn as a jacket or a cardigan. A pattern that one might just want to crochet to become a wardrobe staple. But, I've heard, there are those that like to add a bit of whimsy to their wardrobe. And this pattern offers several suggestions ... 6 to be exact. 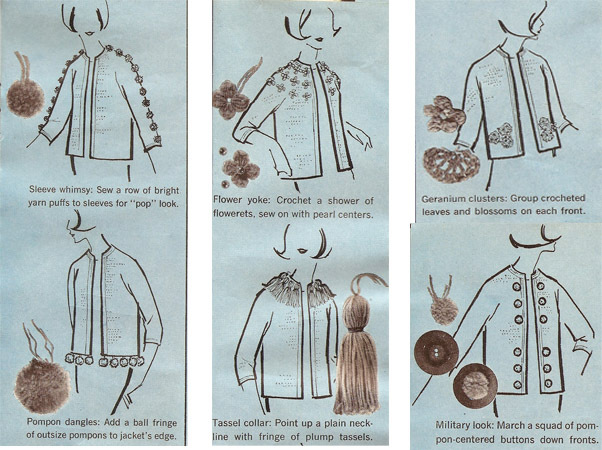 And, of course, pattern instructions to create each of the individual embellishments are included. (Versus some patterns that show you some interesting ideas and then leave you unattended to figure it out !). I particularly like the tassels around the neckline for an interesting collar effect. I've listed this one in my shop. 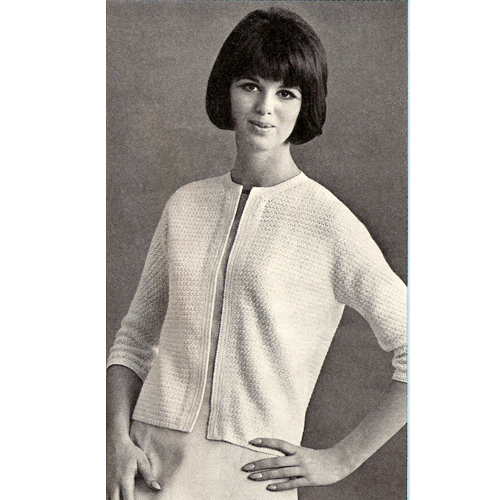 There are of course, dozens and dozens of other crochet jacket patterns in my shop as well.